Brown (or red) phase Ruffed Grouse feeding on winter buds. These chunky, medium-sized birds weigh from 450–750 g (0.99–1.7 lb), measure from 40 to 50 cm (16 to 20 in) in length and span 50–64 cm (20–25 in) across their short, strong wings. 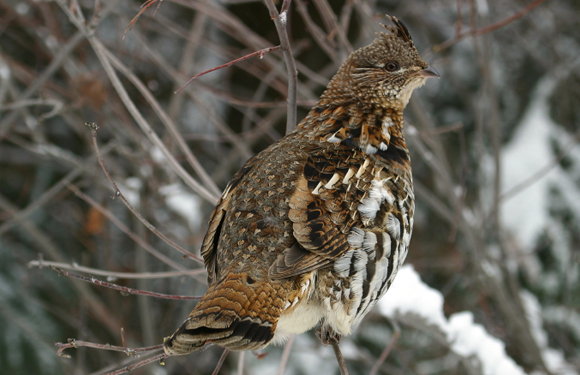 Ruffed Grouse have two distinct morphs, grey and brown. In the grey morph, the head, neck and back are grey-brown; the breast is light with barring. There is much white on the underside and flanks, and overall the birds have a variegated appearance; the throat is often distinctly lighter. The tail is essentially the same brownish grey, with regular barring and a broad black band near the end (“subterminal”). Brown-morph birds have tails of the same color and pattern, but the rest of the plumage is much more brown, giving the appearance of a more uniform bird with less light plumage below and a conspicuously grey tail. There are many intergrades between the most typical morphs; warmer and more humid conditions favor browner birds in general. The ruffs are on the sides of the neck in both sexes. They also have a crest on top of their head, which sometimes lies flat. Both sexes are similarly marked and sized, making them difficult to tell apart, even in hand. The female often has a broken subterminal tail band, while males tend to have unbroken tail bands, though the opposite of either can occur. Females may also do a display similar to the male. Another fairly accurate sign is that rump feathers with a single white dot indicate a female; rump feathers with more than one white dot indicate a male.